Something that we have been seeing more of in the last couple of years has been the use of shutters and doors to create more usable living space. We see shutters and doors being used as windbreaks on decks and around pools, forming the walls of gazebos, cabanas, outdoor showers and even fully enclosing porches. Here operable louver shutters are combined with roman shades to control the light on the porch lobby of this Dude Ranch. Louvered shutters, both operable and fixed, do an excellent job of blocking the wind and Sun. These are usually mounted with hinges or fixed in frames. Another common installation method is to make a simple wood frame with a groove to allow the louvered shutters to slide back and forth. The benefit of the hinges or slide are that you can easily move the shutters out of the way if you want an unobstructed view. If you are looking to drastically reduce the amount of wind or sun consider alternating between louvered shutters and a solid style shutter like a raised panel or tongue & groove. Alternatively if you are looking to block the sun or wind in only a single place on your porch you can always create a mini frame to hold the shutters in that spot and leave the rest open. Just like louvered shutters can be used as windbreaks and sun screens on a porch they can be adapted to stand alone structures like gazebos and cabanas. There they can be used to create walls between the posts and roof supports and even provide security. If hinged they can be opened up to create “windows”. We often see louvered doors added to cabanas to provide privacy as a changing room or outdoor shower. If only a little bit of ventilation is needed choose a style like our louver over tongue & groove. This gives the extra protection and sound insulation from the true tongue & groove boards while still providing some air flow. Operable louvers allow you to adjust how much of the wind and sun is blocked so that you can completely shut out the Sun, wind or rain and then open it up for more gentle breezes. If you have particularly strong winds you may need to attach a simple latch to keep the louvers open or closed during blustery days. Fixed louvers will deflect the Sun, wind and rain but still allow a steady flow of air. This is helpful where there is a concern for overheating and a need for constant circulation. Since the louvers are fixed these are best hinged or in sliding frames. That way they can be opened up when you want. The best thing to do is to go where you plan to add exterior shutters and doors and think about what you want to block. Is it the sunlight, wind, your neighbors house or just the outdoors in general? Do you want to the shutters to cover the entire area or just a part? Will you want to be able to remove or open the shutters or do you prefer them to be fixed in place. Going through these questions will help to narrow down what will work best for your home. If you are still not sure what will work best give us a call, an email or use our online chat. Exterior shutters enclose this pool-side bar and cabana. 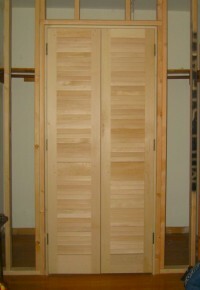 An operable louvered door is used to close of this outdoor changing room. Operable louvered shutters act as a windbreak and privacy screen on this second story porch. Arched, fixed louvered exterior shutters were used to block off one side of this breezeway between buildings. Here is another terrific outdoor project. This customer made great use of Kestrel Exterior Shutters and Louvered Doors when designing their outdoor dining area and kitchen for their coastal home. To allow for both air flow and privacy an Operable Plantation Louvered Door (style 6212) was used for the bathroom. 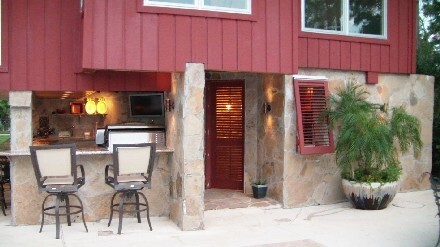 All of the outer windows were fitted with awning style Bahama Shutters. 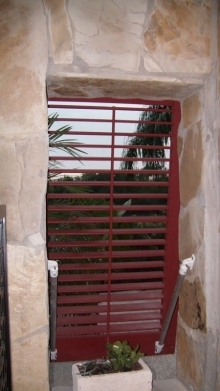 Operable Plantation Louvered Bahama shutters (style 1010) were used where privacy was needed while the other windows had Plantation Fixed Louvered Bahama Shutters (style 2010) to provide constant air flow. The exterior shutters and door were custom sized and built from Spanish Cedar using traditional pegged, mortise and tenon joinery. 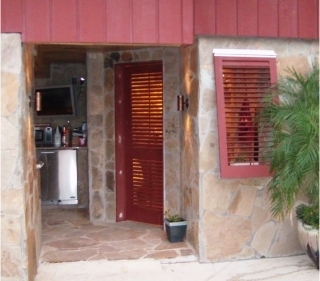 Below you can see the Operable Louvered Doors and the exterior view of the Bahama Shutters. Here from the inside you can see how the Bahama Shutter Hardware is mounted to prop the shutter open creating an awning which is quite effective at screening the sun. We installed Bahama Shutters on the exterior of our Southerly facing office last year. The temperature inside was significantly reduced and the shutters also provided our Geranium packed window boxes just under each shutter a bit of sunscreen. Time to make your wish list of outdoor projects happen and we can help! 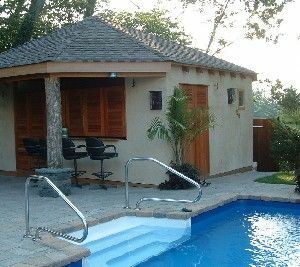 Our Custom-made exterior doors and exterior shutters find a variety of uses outside such as for this terrific poolside cabana. These cabana doors are Kestrel style 6161 – Fixed Traditional Louvered over Tongue & Groove. The customer also installed our 3.1/2″ fixed California Louvered exterior shutters to close over the bar counter window when not in use.